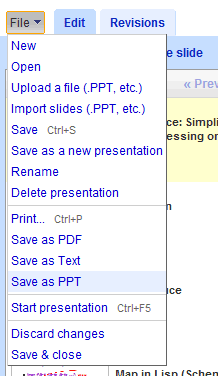 Google Presentations (or Presently) finally added a feature that prevented most people from using it: exporting the presentations to a format that could be imported in Microsoft Office or OpenOffice. Now you can save your presentations as PPT and open them in your favorite desktop applications when you're offline or send them to other people. You can still export the presentations as PDF, a great format for printing. Some other features that should be available soon in Presently: inserting tables, adding YouTube videos and viewing presentations offline. When are they going to let you store pdf's as well. Frankly, the biggest obstacle to using online office software, be it Google Docs or Zoho office is the limited formatting ability. Any time I upload a file the formats are off. Improve this and I will reconsider your service. That's fantastic, something I've been waiting on for a while. But something else I would like to see is support for the iWorks suite. I suppose there is a roundabout way (exporting my Keynote presentations as PPTs and uploading them), but direct support would be a lot quicker for me. Also, a few basic slide and content transitions would make things a lot more fun too. But I'm proud to be a Googleholic. Anything Google creates has my utmost praise ... then I use it. Keep it up guys. I think I am having a similar issue. On a power point presentation that I transfer to GDocs, work on with a group of people, then transfer back to PPoint: the graphics all will not display correctly. This is Frustrating because there are about 150 slides. Initially I thought (while a total pain) I could just copy the graphics from the old presentation and paste them onto the new, but it behaves almost as if the presentation that was in google docs is now some other program all together and it won't let me do this. If anyone has any suggestions, I would appreciate it. At this point, we are thinking about just having one person handle all of this work instead of doing collaborative software due to the amount of extra work this creates in order to make it look correct.